Desert safari Dubai is the best solution to cure the adrenaline junkie and the nature lover inside you. This incredible fun-filled safari offers a number of thrilling activities as such as quad biking, sand boarding, dune bashing, 4×4 hummer ride etc. At the same time, if you are looking for a relaxing day out then once again Dubai desert safari is your answer, as it also offers henna applying, camel rides, photo shoots, overnight camping, exotic belly dance and a delicious dinner under the starry sky. 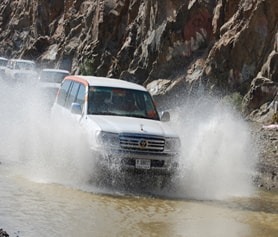 We at Dubai safari trips aim at providing you with a budget-friendly, comprehensive and memorable off-road drive.